MLB Trade Rumors: Are Giants Making Progress Toward Giancarlo Stanton Trade? Each day, it seems like new reports surface about the fate of Miami Marlins outfielder Giancarlo Stanton. It appears inevitable that he will be traded but right now nothing is imminent. Moreover, the entire hot stove season may be on pause until the Marlins trade Stanton. However, there appears to be no urgency on the part of the Marlins to make a deal. Stanton’s suitors, on the other hand, are quite interested in getting a deal done. There are several teams with interest in Stanton, and it appears like the Giants are trying to make themselves the favorites. Reports published Tuesday indicate that the Giants have had “deeper discussions” with the Marlins about a trade involving Stanton. This comes on the heels of reports that the Giants made a formal offer to the Marlins. It’s believed that the framework of the proposed trade involved both Stanton and second baseman Dee Gordon going to San Francisco. Meanwhile, the Marlins would receive second baseman Joe Panik, as well as prospects Tyler Beede and Chris Shaw. However, it’s also possible that the Giants and Marlins are simply exchanging names. Also, there’s no indication that the two sides have spoken about how much money the Marlins may potentially be sending to San Francisco. The Giants have payroll flexibility, but that doesn’t mean they would necessarily take on Stanton’s entire contract. There are also reports that the St. Louis Cardinals have also made a formal trade offer to the Marlins. It’s unclear what players could be involved in that proposal or what players the Marlins and Cardinals have discussed. However, it’s believed that the Marlins might prefer to do business with the Cardinals as opposed to the Giants. St. Louis has a stronger farm system than San Francisco. The Cardinals are reportedly willing to part with one of their top pitching prospects in a deal involving Stanton. St. Louis also has a rather crowded outfield. The Cardinals would obviously find a way to make room for Stanton. But they could also send an outfielder or two to Miami, giving them an immediate replacement for Stanton. The caveat is that Stanton may be more likely to decline a trade to St. Louis than he would San Francisco. As a California native, it’s believe Stanton wants to be one one of the coasts, not in a city like St. Louis. 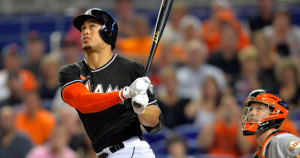 Amidst trade rumors during the summer, someone in Stanton’s camp said this year’s National League MVP would likely veto a trade to the Cardinals. With all the reports in recent days, it seems like the Giants and Cardinals are making the most effort to trade for Stanton. However, things are moving slowly and it doesn’t seem like there will be a resolution any time soon. The Winter Meetings are still more than two weeks away, and it’s possible that nothing will happen with Stanton until then. In the meantime, the entire baseball world waits.